In 2000, we conducted experiments in three prune orchards in Yolo, Butte, and Tehama Counties. At each location, inoculations were conducted at five developmental stages, at bloom, pit hardening, embryo growth, late embryo growth, and before first harvest. In each inoculation, five inoculum concentrations, 1,000, 5,000, 10,000, 20,000, and 30,000 conidia/ml of M. fructicola, were used. Branches bearing 40-60 flowers or 20-30 fruit were selected, and each was sprayed uniformly with 50 ml conidia suspension and covered with a plastic bag to keep high humidity. For each location, six wetness durations (4, 8, 12, 16, 20, and 24 hours) were accomplished at bloom stage and four wetness durations (4, 8, 12, and 16 hours) were accomplished at fruit developmental stages by uncovering the plastic bags at different time after inoculation. Fruit were maintained on the inoculated trees until they were collected 3 weeks before commercial harvest. An overnight freezing incubation technique (ONFIT) was used to determine the incidence of fruit with latent infection. For each sample, fruit were surface sterilized in a chlorine solution (32 ml of 0.525% sodium hypochlorite, 32 ml 95% ETOH, and 0.01 ml surfactant Tween-20 in 2 L water) for about 15-20 minutes, then washed with sterile distilled water 10 times, and placed on a sterilized plastic screen in a container with 150 ml water. The containers were placed in a freezer at 3.2ºF [-16º C] for 10 hours initially and then on a laboratory bench at room temperature for 5 days. By this time, fruit covered with sporulation of M. fructicola was recorded, and incidence (%) of brown rotted fruit was calculated for each sample. Results among the three locations were consistent. Incidences of latent infection (ILI) were significantly different among different developmental stages (Fig. 1A). The average ILI at bloom stage was about 8.6%. However, the fruit susceptibility to infection increased after full bloom, and this increase lasted about a month. Considering the entire prune growing season, the most susceptible stage to infection was before pit hardening (from late April to early May). After early May, the susceptibility to infection dramatically decreased until it reached the lowest level in early June. Along with increasing fruit size and maturity, the susceptibility of fruit to infection increased from early June, reaching a moderate level in late July about 3 weeks before commercial harvest (Fig. 1A). In general, fruit were more susceptible to infection when they were young and mature than when they were in middle age (late May to early June). The ILI linearly increased along with increased inoculum concentration (Fig. 1B). In general, an increase of 1,000 conidia/ml brought about 0.5% increase of ILI. Moreover, an increase of wetness duration led to an exponential increase of ILI (Fig. 1C), and the rate of exponential increase was 0.1443 ILI/hour of wetness duration. Exponential regressions between ILI and wetness duration were also obtained for most inoculum concentrations at different developmental stages. These experiments demonstrated that fruit were most susceptible at about pit hardening stage and most resistant at about embryo growth stage. Moreover, the effects of wetness duration on latent infection were different at different stages. In addition to a seasonal pattern of fruit susceptibility to latent infection by M. fructicola, the above experiments also demonstrated that risk of latent infection changed during the growing season. Thus, the microclimate conditions leading to certain latent infection levels should relate to the seasonal pattern of fruit susceptibility to latent infection. Seasonal patterns of risky weather are important and useful to guide disease control. Data of above experiments with the inoculum concentrations of 5,000 and 10,000 conidia/ml were combined to refer to as the low inoculum potential and those of 20,000 and 30,000 conidia/ml were combined to refer to the high inoculum potential. Exponential regressions between ILI and WD for each bloom and fruit developmental stage and inoculum potential were used to calculate the WD when the ILI value is assigned. For each inoculum potential condition, four risk levels of latent infection were assigned as follows: no risk when ILI < 1%, low risk when 1% = ILI < 5%, moderate risk when 5% = ILI < 10%, and high risk when ILI = 10%. The WDs leading to the corresponding risk levels were calculated by converting the corresponding exponential regressions. These WD values were determined for each bloom and fruit developmental stage and were used to draw three smooth curves over the growing season for both low and high inoculum potential conditions (Fig. 2). These curves demonstrated the seasonal patterns of risky wetness duration leading to different levels of latent infection. Basically, these patterns were related to the seasonal patterns of bloom and fruit susceptibility to latent infection. Basically, a longer WD is required at the resistant stage than at the susceptible stage (Fig. 1 A) to induce a similar level of latent infection. Under the low inoculum potential condition (Fig. 2A), the risk of latent infection is associated with relatively longer WD at the bloom than at the pit hardening stage. For example, if WD is shorter than 2.1 hours on April 1, there is no risk of latent infection. When the WD is between 2.1 and 11 hours, there would be a low risk of latent infection. Only the WD over 21.5 hours could lead to a high risk of latent infection. However, under the high inoculum potential condition (Fig. 2B), longer than 7.6 hours of WD could lead to a high risk of latent infection. Along with increased susceptibility to latent infection from the bloom to the pit hardening stage, the WD leading to different risk levels of latent infection decreased. For example on May 4, moderate risk of latent infection is associated with WDs between 5.2 and 11 hours under the low inoculum potential condition (Fig. 2A) and between 0.8 and 6.4 hours under the high inoculum potential condition (Fig. 2B). After the pit hardening stage, fruit susceptibility to latent infection dramatically decreased until embryo growth, and the WDs leading to risks of latent infection increased (Fig. 2). For example on June 3, when WD is shorter than 8 hours, there is no risk of latent infection under the low inoculum potential condition. When WD is longer than 4 hours, it may lead to a low risk of latent infection under the high inoculum potential condition (Fig. 2B). After mid June, the fruit susceptibility to latent infection increased again (Fig. 1A), and WDs leading to risks of latent infection decreased. These seasonal patterns of risky wetness duration could be used to guide decision for disease control. We also analyzed the historical weather conditions leading to different risk levels of latent infection for 10 sites in California including Gerber, Orland, Durham, Colusa, Davis, Lodi, Modesto, Los Banos, Parlier and Visalia, each representing a corresponding county where prunes are grown. Weather data, including hourly air temperature, dew point temperature, and precipitation from 1983 to 2000 were collected from the California Irrigation Management Information System (CIMIS). 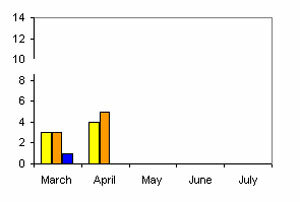 These data were used to calculate dew period in hours for each day from March through July. For each date, if the dew period was below the low risk curve on the corresponding date (Fig. 2), no risk day was counted. If the dew period was between the low and moderate risk curves, a low-risk day was counted. If the dew period was between the moderate and high risk curves, a moderate-risk day was counted. If the dew period was higher than the high risk curve, a high-risk day was counted. The number of days associated with low-, moderate-, and high-risk levels of latent infection were summarized for each month. Average number of days associated with these four risk levels of latent infection was calculated for each month and for each of ten locations using the multi-year weather data (table 1). These data were referred to as the number of days leading to risks of latent infection. The information could be used to compare the current situation. In making decisions for spray control, growers may need to know a similar historical weather situation and how high the probability of a similar weather and disease situation was. If the current situation is more risky than an average situation, a spray will be necessary. For example in an orchard at Gerber, a location in northern Sacramento Valley, if the predicted WD is 10 hours on May 10, the WD may lead to a moderate risk of latent infection under the low inoculum potential condition. As a reference, the average days with such condition that occurred historically in this month is 3 days (table 1). According to the above estimation, the grower may decide to spray because in this period prunes are at a very susceptible developmental stage, and only an average of 3 days of this month with the same situation occurred historically. If the disease infrequently occurred in the past in the orchard, the current situation may lead to a latent infection level that needs to be reduced. However, the grower may decide not to spray to sustain a certain risk because such risky WD would probably occur only 1 day in this month in the future. The approach of risk analysis for latent infection was evaluated with our previous experimental data. One example used the data of experiments conducted in prune orchard of four counties in 1993. The average incidence of fruit brown rot from naturally infected trees was used in the evaluation process. The corresponding daily WDs leading to low, moderate, and high risks of latent infection were calculated from each location's historical weather data. These WD data were used to calculate the number of days associated with low, moderate, and high risk of latent infection for each month, and then to compare the historical number of days associated with the corresponding risk levels of latent infection on table 1. For example in the orchard in Tehama (Fig. 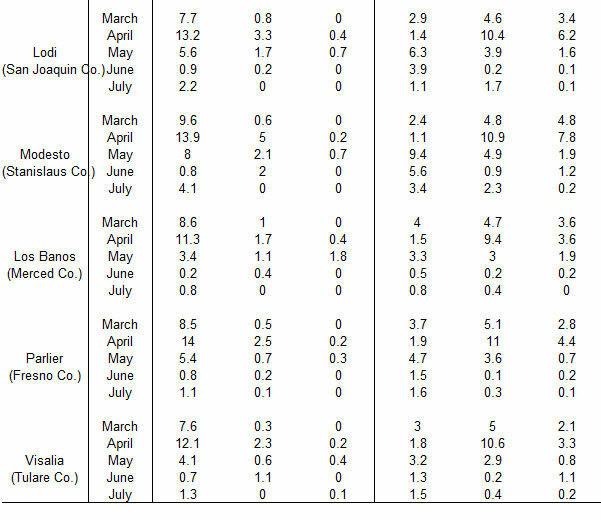 3B), the information in table 1 for Gerber (Tehama co.) was used in the comparisons. 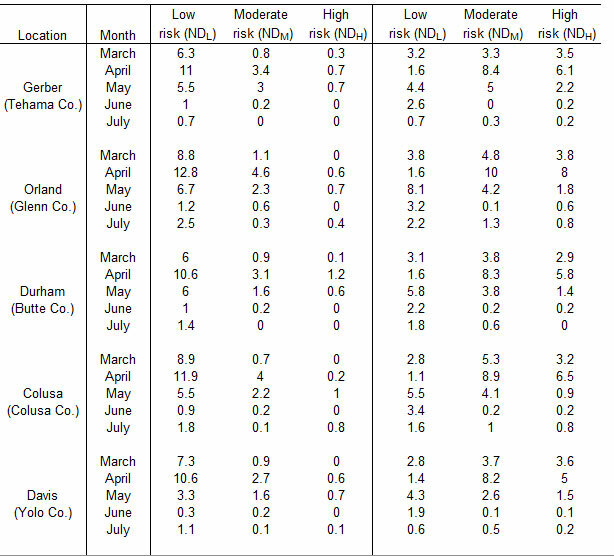 A moderate risk of latent infection was predicted in March and April, since number of days associated with moderate risk in March (6 days) and April (9 days) were all greater than the corresponding mean values (3.3 days for March and 8.4 days for April) (table 1, for Gerber). Therefore, an overall moderate risk of latent infection was predicted (Fig. 3B). The observed average fruit brown rot was 7.2% that was within the range of moderate risk level of latent infection. The high risks of latent infection were predicted in the Butte and Sutter orchards, since a moderate to high risky condition occurred in March in the Butte orchard, and a high risky condition occurred in March in the Sutter orchard (Fig. 3C and D). The observed incidences of fruit brown rot in these two orchards were all greater than 10% (Fig. 3C and D). Generally, overall predicted risk levels of latent infection were consistent with the observations of fruit brown rot.